The nation of Myanmar has only had an independent press for three years, since the longtime military junta began transitioning to a civilian government. In that short time, though, a new generation of cartoonists has arisen to document and respond to the bumps and triumphs on the road to democracy. While they’re still on the receiving end of a fair amount of censorious pressure and intimidation, many of the younger cartoonists have found that sharing their work online allows them to reach a much larger audience and sometimes escape the notice of authorities. They are always watching our cartoonists. If you write down text, a lot of people won’t read it. 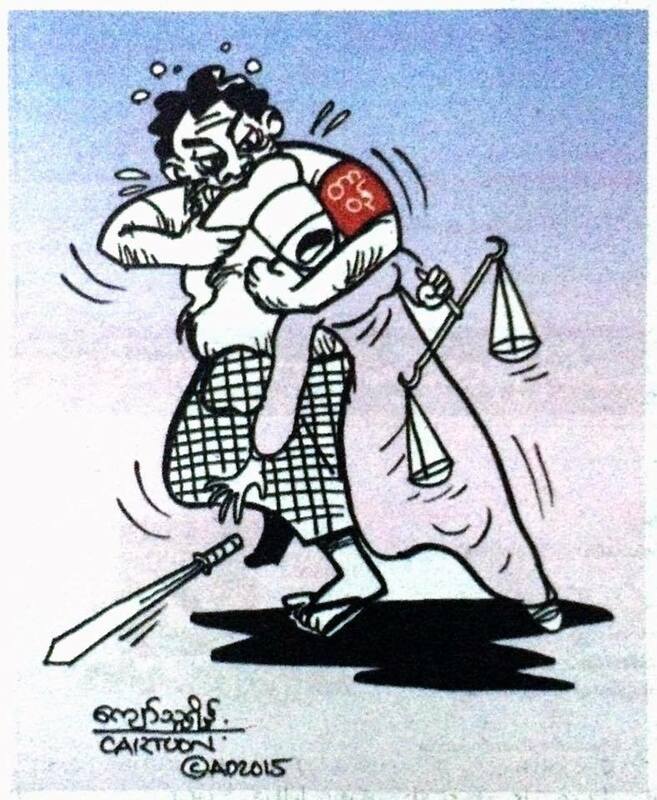 But if you do cartoons they see it…They say there is freedom, but still this kind of thing is happening to a lot of cartoonists in Myanmar. Another young cartoonist, Kyaw Thu Rein, admitted that “I don’t believe in media freedom 100 percent now, so I create my cartoons very carefully. I take care to create cartoons not to anger the government, just to make them know what is happening in real life.” He says skewering religion à la Charlie Hebdo, for example, simply is not possible in Myanmar. But when protesting students were recently met with violence from a government militia, cartoonists were the first to document it via social media. 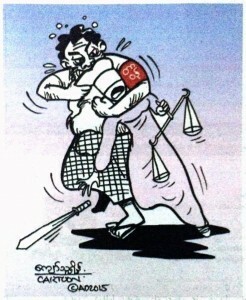 Aw Pi Kyeh was impressed at his younger colleagues’ promptness in spreading the news worldwide, saying “they are very good people, they are dutiful.” Indeed, the future looks bright for cartooning in Myanmar–but if the government wants to demonstrate its commitment to democracy, it could start by tolerating and even welcoming dissent in the form of drawings.